Pictured is one of the four EV charging stations recently installed in the parking lot of the Powell Municipal Building, 47 Hall St., Powell. As the popularity of electric cars continues to grow, more and more cities are investing in charging stations to accommodate the increasing interest. Last week, the City of Powell opened up four charging ports in the parking lot of the Powell Municipal Building at 47 Hall St. There are two ports specifically for Tesla models, and two ports for all other electric models. Through Tesla’s “Destination Charging” program, the four charging ports were funded almost entirely by the electric vehicle (EV) manufacturer. Powell Assistant Director of Development Rocky Kambo said the city spent less than $1,000 on the installation, compared to over $10,000 spent by Tesla. Last year, Tesla eclipsed 5,000 locations where the company has installed charging stations. Kambo said the driving force behind installing the ports was to “spur economic development in our beautiful, historic downtown core.” He said it will cost the city a dollar per hour to charge a car, but the idea is that the people who park and charge their cars there will spend more than a dollar or two while they’re downtown. 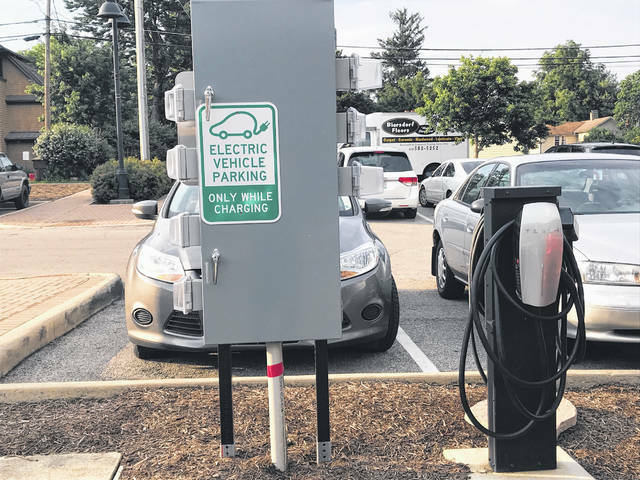 In order to determine the need for these stations — if there were a need at all — Kambo looked at the number of electric cars registered in the area from 2013-2015, through figures provided by the BMV. Those figures showed the 43065 zip code (includes Powell) had more electric cars registered than other nearby zip codes, which include the likes of Delaware, Lewis Center and Worthington. The municipal building was chosen as the location for the stations because it was the least expensive place to install them while still providing a high visibility rate, Kambo said. In addition to the potential business they will bring to the downtown shops and restaurants, Kambo added there is a significant lack of stations in Powell. In fact, the presence of EV charging stations was non-existent previously. Before the installation at the municipal building, the nearest stations were either in Dublin or Lewis Center. The charging stations are on a pilot basis for now. Kambo said that, in the future, the city could decide to remove or turn some of them off. However, he hopes and expects that based on usage and demand, the city will look to add more stations in the future. https://www.delgazette.com/wp-content/uploads/sites/40/2018/07/web1_tesla-1.jpegPictured is one of the four EV charging stations recently installed in the parking lot of the Powell Municipal Building, 47 Hall St., Powell.